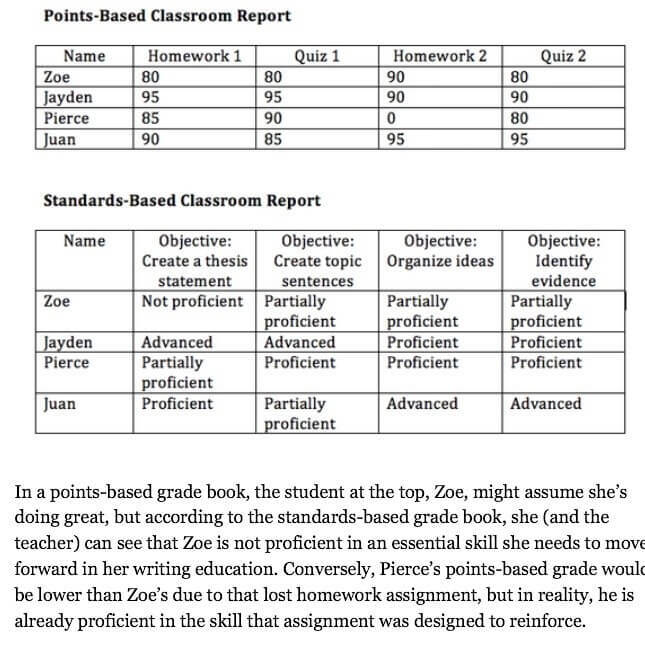 In a points-based grade book, the student at the top, Zoe, might assume she’s doing great, but according to the standards-based grade book, she (and the teacher) can see that Zoe is not proficient in an essential skill she needs to move forward in her writing education. Conversely, Pierce’s points-based grade would be lower than Zoe’s due to that lost homework assignment, but in reality, he is already proficient in the skill that assignment was designed to reinforce. —The Atlantic. 16 Mar 2014 in Academia, Culture, Design, Education, Modding, Rhetoric. That’s a interesting idea. The reports we have to do at my school (which I’ve always considered mostly to be busy-work) are actually done in a similar way. As a private language school, we don’t really give out grades, but we rate students in a variety of skills (listening, pronunciation, grammar, vocabulary, etc). Because it’s completely subjective, our ratings are singularly meaningless, but they do reflect progress over time. While I think it might be a useful addition for a freshmen class (and k-12), I think it runs the risk of cutting out the need for self-assessment. In the example, Zoe should have been able to reach the same conclusion by noticing that on every single essay she got back, the first thing the comments said was “you need a thesis statement.” For freshmen comp, at SHU specifically, it might be a useful tool to give them early on (mid-terms maybe) and then have them do it themselves (perhaps with some guidance) prior to writing the self-evaluation essay at the end of the course (obviously, I only took that class once, but I assume the cirriculum is pretty standard). This is how our school grades. It was confusing at first and i still want actual numerical/letter grades (which they dont give) but the information is very useful in teaching young children. Rather than “this kid is bad at math” it allows each skill to be broken down. Now it is ” this child is great at counting by ones, but they struggle with counting by 5’s” . Important information for teachers and parents alike.